There are two other species with yellow flowers, unknown in cultivation, both native to the Caucasus. P. tomentosa (Lomak.) N. Busch. Russian botanists accept also some other Caucasian species, such as red-flowered once: P. biebersteiniana Rupr., P. carthalinica Ketsk., P. majko Ketsk. and P. ruprechtiana Kem.-Nath., also pink-flowered P. lagodechiana Kem.-Nath. Some of these species are probably of hybrid origin. All are of horticultural value. P. cartalinica, with bright red flowers and leaves with narrow linear lobes closed very much to P. tenuifolia; and P. majko, with large, red flowers and bi-triternate leaves are especially attractive. Both occur in Georgia. Paeonia tomentosa (Lomak.) N. Busch. Paeonia albiflora Pall. 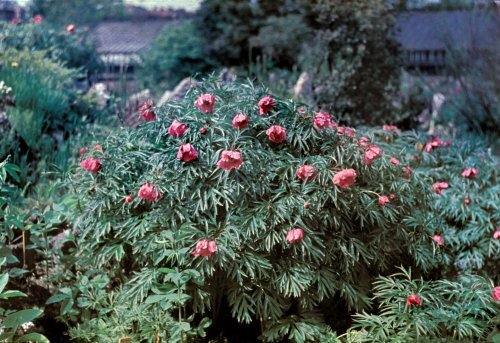 = Paeonia lactiflora Pall.